This stand for 1/32 to 1/ 24 scale is flexible in all directions and helps you during monoplane building, painting, applying decals, etc. Also serves for absolutely safe model transport after chained it by rubber O rings across wings and fuselage. The scales on the base plate is used for symmetric stretching arms from the center axes in the range 150 mm to 426 mm. 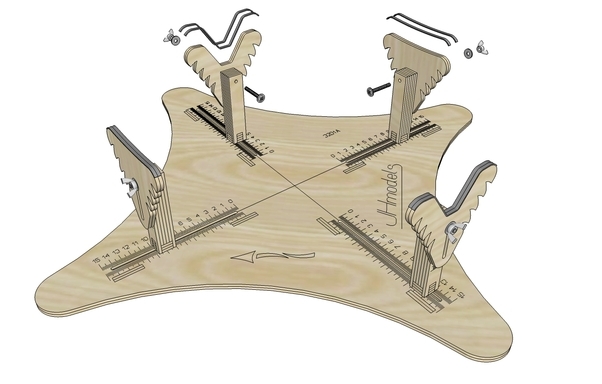 Material: poplar plywood 3 mm ( base plate, reinforced cross and support parts are doubled because of greater weight of models ) + hardware, Tan II rubber belt 0,5 x 3 mm serves to protect the bearing surfaces of the model surface from scratches, rubber O rings for attachment of model during transport, stand feet pads, instruction. You will also need: white or CA glue, cross screwdriver not included.